"ONE IS THE LONELIEST NUMBER, In The Northern Forest!" As the song says: One is the loneliest number, does not apply to life here in the Northern Forest! As you can see from the above photos, you are never alone here with the mosquitoes to my canine family, I am not alone! Yes, this is a little humor! But, one has to have one (sense of humor) when dealing with the early Summer abundance of flies. As a side note: swatting mosquitoes and houseflies is great for improving your hand/eye coordination and reflexes. This week, the focus here was stormy weather and flies. With all the dampness/humidity the insect population exploded. We are currently enjoying Black Flies (just about finished), Horseflies (big ones), Deer Flies, Houseflies and of course Mosquitoes! Although these critters are annoying, their presence normally don't last too long and if protected don't bite. The dogs are not bothered this year by most of the flies with the exception of the Horse Flies that try to bite them. Luckily they are not in abundance. The dogs are enjoying their refurbished kennel with all the fresh new sand. Makes digging that much easier! With the wet weather, cooking makes up for the dreariness! Another positive, it is with great please to announce the Jack Trigg will be joining the Miortuk Team for the 2017/18 season. "Good Friends Make A Major Difference In The Northern Forest!" What a difference 6 hours can make. Thanks to the work of Denis Tremblay, a good friend and fellow musher, the kennel was transformed and refreshed in only 6 hours! That meant all the dogs were moved out of the kennel to stake out chains, all the houses and pins removed from the kennel. Kennel then leveled, 12 dump truck loads of new sand brought in, then the new sand spread/leveled, pins and houses reinstalled and finally dogs returned to their newly refurbished kennel. Merci Denis, I am so grateful! So are the dogs with nice new/fresh sand to dig in. Now keep it raked daily to fill in their excavations. You got too love it! We had a few beautiful sunsets as seen in the above photos. Also this week, hot humid weather brought out an incredible abundance of mosquitoes. But, on the good news, the Dragonflies have hatched and are busily eating up the pesky mosquitoes. With a bumper crop of mosquitoes, they have their work cut out for them. Dragonflies will eat up to 15% of their body weight daily. It is interesting how Nature takes care of itself. This week Lena went to a new home were she will be run and bred. 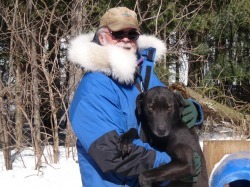 Lena is a big female and her new musher is looking to produce larger dogs. This was the best move for her. She was a great Wheel Dog here and her work ethic was greatly appreciated. I would also like to thank Valerie and Laurent Gonsolin for their assistance in making this relocation happen. I am a lucky musher! "Beautiful Mornings, Evenings And HomeMade Pizza In The Northern Forest!" Yes, that is not a bad combination. It has started to warm up here with temperature getting into the high 20's C.
However, along with the warmer temperatures the Black Flies and the Mosquitoes are thriving! Although it is uncomfortable for me, the dogs are not being bothered by the pesty insects. It must be the garlic powder that is added daily to their feed. I have been doing this for a long time and it seems to make a difference. However, when one of my canine friends jump up for a pet and lovingly look you in the face and then after their meal burp, well you can guess the rest. It is just one of the many enjoyments of interaction. Even though, Miortuk is a way to far for Take Out delivery, it doesn't mean that the enjoyment of food is lacking. It just means that you have to learn to cook it for yourself! Example being the pizza enjoyed here on Friday Night. Just swatted another mosquito while writing this. You have got to love it! "Sanctuary Here in The Northern Forest!" Yes, life here in the Forest is, for me, a sanctuary away from all the craziness of the outside world. I am so very fortunate to wake up every morning and have such a spectacular view! the daily interaction with my canine family. It is an extreem effort for me to venture outside my Sanctuary!